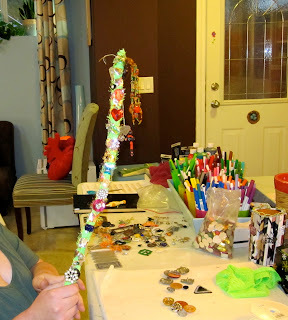 Last week several of my younger clients made wands. Their wands had many purposes; some had powers to make everyone nice, some gave secret powers of strength and endless candy, and some wands changed bullies into snakes. Throughout history wands have been made from wood, sometimes stone, or metal. Their ceremonial use is well documented. They are often associated with magic, but are also used for many other purposes. In formal government ceremony, special officials may carry a wand of office or staff of office representing their power. Wands throughout history have been used for channeling energy, healing, spell casting and to represent power. I explained to the children with whom I work, that we need to have a belief that we can be powerful agents of positive change and that belief can be carried inside us like one of the jewels that they used to emblazon their wands. We talked about how change begins inside us and then flows out into the world and touches others, just like when they stood in the therapy room and pretended to touch their friends with the wand. We talked about how people change, how magic happens and what is power. I never know where an idea for an art project will take my clients and I. But, sometimes it’s magic. Hi, I am a high school student and I have been given a project in which I must research a topic of my choice and also find a blog on the same topic. I am very involved and art and would like to pursue a career and art so i chose art therapy as my topic. My interest for art therapy has grown and I would like to know if you know of any other websites, blogs, etc. Any thing would help, thanks!